Drone technology is improving at a steady pace, and autopilot features including auto takeoff, landing and waypoint navigation have become standard on mid to high end drone hardware. Now, the focus is on “sense-and-avoid”, the next potential breakthrough that can enable truly autonomous flight of small UAVs and lead to a dramatic increase in real world drone applications. As of now, sense-and-avoid technology is still a work in progress. Despite drone manufacturers and technology providers touting the capabilities of their latest products and solutions, current sense-and-avoid systems simply cannot provide reliable obstacle collision avoidance in all environmental conditions and at all times. Even the latest and most expensive consumer drones can fail to avoid collision when faced with a number of real world situations due to limitations in the sensors being used: optical sensors which require good lighting, and LiDAR and ultrasonic sensors which require ideal weather conditions. The team at Aerotenna has engineered and tested a microwave radar solution for obstacle collision avoidance. Aerotenna μSharp, a 360° sense-and-avoid radar small enough to be integrated into consumer drones, has the robust performance needed for reliable obstacle avoidance in any weather condition at any time of day or night. μSharp scans 360 degrees without blind spots, detecting and locating obstacles on the horizon quickly and reliably, which allows for correction of flight course in time to prevent collisions. The system incorporates adaptive sensing technology that optimizes its response, regardless of flight status. With its robust performance and integrated design, μSharp is a modern collision avoidance radar system for any UAV. 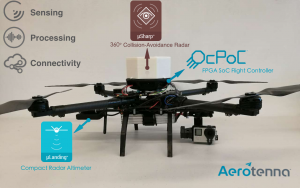 Aerotenna’s μSharp 360° sense-and-avoid radar, along with the μLanding radar altimeter, introduce microwave sensing technology to the world of consumer and commercial drones and set a new standard for UAV sensing systems. For sense-and-avoid technology, the integration of radar as part of a collision avoidance system is a crucial step in the development of truly autonomous drones that can better serve people and society in more ways. μSharp is set to be released in October as a EVM kit for drone manufacturers and academic users. Please contact Aerotenna with inquiries or pre-order requests.